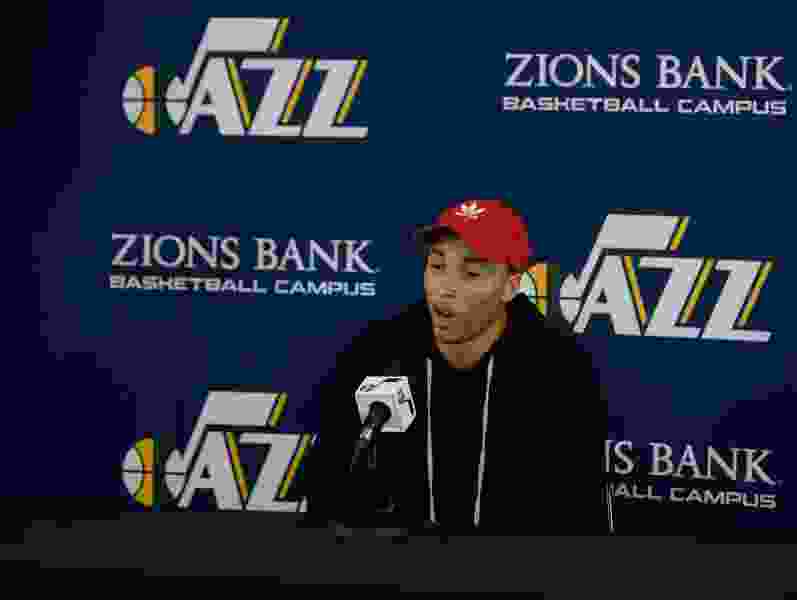 (Francisco Kjolseth | The Salt Lake Tribune) Utah Jazz Dante Exum speaks with the media during exit interviews at their practice facility in Salt Lake City Wed., May 8, 2018, after losing to the Houston Rockets in game 5 of their Western Conference Finals during the 2018 NBA Playoffs. While the buildup of NBA Draft hype is an annual tradition, there’s always a subtext: It’s not a cure-all for what ails a team. Coming away with one draft pick on Thursday night, the Utah Jazz feel good about Grayson Allen, who they had high on their board. But the pick is also a reminder of the confidence the Jazz have in the players already in their building. In the 22-year-old Allen, the Jazz have a shooter who they hope can play either guard position, who has some upside as a playmaker and may need to shore liabilities as a defender. But the Jazz also drafted Allen for who he is not: He doesn’t have dramatic overlap with other players on the roster, including all of Utah’s free agents this offseason and several of his teammates in Utah Summer League who will be trying to carve out a niche. Asked how Allen fit into the Jazz scheme, general manager Dennis Lindsey didn’t talk about plays. He talked about people. It’s a telling sign for a Utah organization trying to remain above the choppy waters of the Western Conference while working to reach the tier where Golden State and Houston reside. Allen, a four-year standout at Duke, is more of a polished product than several other wings the Jazz passed on, one who might help sooner rather than later. And yet Allen, barring a suprising surge as a rookie, won’t be the piece that bridges that gap. That could be Derrick Favors, who is testing free agency, but has said he’s open to returning. It also could be Exum, who has shown flashes of his top-5 potential in between a frustrating string of injuries. It’s notable that the Jazz didn’t draft any players who could look to replace either of them — even restricted free agent Raul Neto still could have a defined role as Utah’s third point guard. While the Jazz can’t communicate with free agents until July 1, the draft can be read as a vote of confidence that Utah hopes to bring back those pieces. It was also telling that the Jazz, who have brought back three picks each of the past two seasons, sold their second-round pick to the Houston Rockets for cash considerations. It’s not a typical move by the Jazz under Lindsey, but Utah’s competition for roster spots could be as competitive as ever: 2017 first-round pick Tony Bradley has spent much of his offseason in Utah to develop his game and prove he can merit a future role with the Jazz. Lindsey also name-dropped Georges Niang, a two-way player who dominated the G-League last year, has spent some of his offseason in Utah, and he hopes to take another leap. Erik McCree and Naz Mitrou-Long also hope to make an impression in Summer League starting on July 2. Lindsey said that all of those players are already motivated, regardless of the draft’s outcome. But it certainly opens a door for them to find a way onto the roster. And it shows the Jazz aren’t necessarily always trying to bring in fresh talent — betting on their own track record of player development is sometimes a smart move, too.